Ask fellow campers about "Squaw Creek Campground (Linn County Park)" and nearby attractions. cant go wrong here for a stopover. Some sites had full hookups and all had concrete pads I think. No negatives on this park other then not sure what there is to do around the park. It was a Thursday night and the place was almost filled up. I would stop again for sure if in the area. We camped at Squaw Creek Campground (Linn County Park) in a Travel Trailer. Nice level sites. Could use more trees for shade in loop A. Ranger was very nice, grass was extremely long and unkept. I have seen it this way before. It seems, especially on weekends, that they would make sure it is kept groomed. Some people mowed around their own sites. They need to mow more frequently and get a better trash dispenser. We camped at Squaw Creek Campground (Linn County Park) in a Fifth Wheel. One of the nicest parks I have ever stayed in. Level concrete pads with easy hook ups. Very well maintained with really nice views. Park Rangers are very helpful and very friendly. Sometimes it fills up quick. In loop A you are better off having a reservation!! We camped at Squaw Creek Campground (Linn County Park) in a Fifth Wheel. This park was such a welcome site after camping in mud for the previous two weeks! It is gorgeous - possibly the best park we've ever had the opportunity to camp in. Mostly pull-through sites, all with beautiful full hookups, most with easy satellite access. The sites were big all seemed to have views of some sort or another. I can't say enough nice things about this park. I'd give it 10 stars if I could! We camped at Squaw Creek Campground (Linn County Park) in a Motorhome. Stayed overnight. Easy self-registration. Nice grass and good utilities. Very nice county operated park. We camped at Squaw Creek Campground (Linn County Park) in a Motorhome. Great place with roomy sites. The front loop has full hookups and mostly pull through sites that can handle big rigs. Concrete patios with picnic tables and fire pits. The back loop is older with only a few sites having electricity but costs less. Lots of room between sites and an outstanding playground for the kids. We camped at Squaw Creek Campground (Linn County Park) in a Travel Trailer. This campground has an excellent playground, clean but minimalist showers, and a few short trails. Since it is so close to Cedar Rapids / Marion the cell coverage is great. I plan to return regularly. Note that there are 2 loops to this park. The loop with sewer connections is reservable, but costs more. The other loop is first-come first-serve. We camped at Squaw Creek Campground (Linn County Park) in a Travel Trailer. This is very close to Lindale Mall, the primary shopping district on the northeast side. 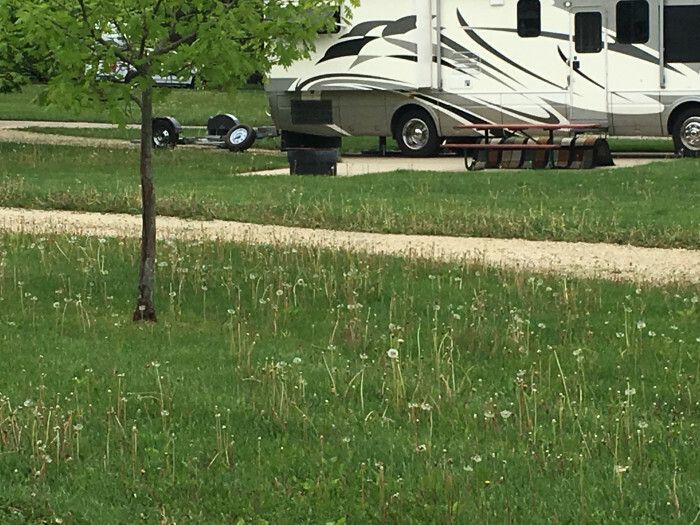 Beautiful campground near a golf course and shopping. No WiFi all other amenities are top notch, kept very clean and serviceable. Two campgrounds in one here. Loop A is nearest the entrance to the park and has concrete pads with full hookups (except for a few sites that do not have sewer). Loop B is Water and Elec only. Loop B has a beautiful canopy of mature trees while Loop A has more recently placed trees providing good access to a satellite signal. (Loop B is hit and miss on the Sat signal). The reservation system is a bit of a pain but if you want to camp here reservations are necessary for Loop A. Loop B is first come first served. Go to the Linn County Parks web site and carefully read and understand how the reservation system works and know that all reservations must be made 5 days in advance!!! 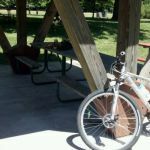 We are regular visitors to this campground and find it best to make reservations or enter the park mid week for Loop B. We will camp here again. We camped at Squaw Creek Campground (Linn County Park) in a Motorhome. This is a wonderful county park. There is no sewer hook-ups, but the water pressure is good as is the electrical voltage. The park has two areas, "A" and "B". The A area is the newest and requires a reservation, it has cement pads and full hook-ups and is $5.00 more per night. "B" section has gravel sites, mostly back-ins, mature trees, lots of room and is away from the road into the park. This section is on a first come first served basis. Weekends fill up starting on Thursdays; weekdays however is mostly empty. Some of the sites are a long way from the bath house. The area is rolling hills and is beautifully landscaped. It is about 5 miles to town and all the amenities that a person would need. I will be back to this park. We camped at Squaw Creek Campground (Linn County Park) in a Motorhome. Squaw Creek has an "old" area and a "new" area. The new area has concrete pads and full hookups. You can only stay here 1 night at a time without a reservation; you could have to move any day. With a reservation, you pay $30 night. In the old area, you get mature trees with water and electric. We chose these at $20 a night. The sites in the back of the loop are not really walking distance to the bathhouse. The bathhouse is fairly new and very clean. We've been here 3 times and would come again. We camped at Squaw Creek Campground (Linn County Park) in a Motorhome. 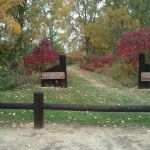 Squaw Creek is a great county park to stay in when in the Cedar Rapids metropolitan area. 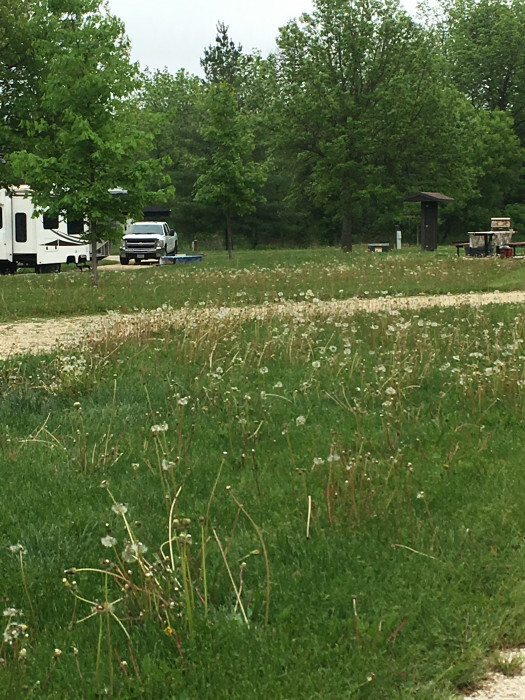 The campground is divided in to two adjacent campgrounds: (1) a non-reservation section which has electricity and water with gravel pads, and (2) a reservation section that has FHU and mostly concrete pads. Everything else is the same for both sections. The interior roads are blacktopped and any size rig can be accommodated. Every site has a fire ring and a picnic table. The grounds are groomed and the trees throughout the park pose no problems. The new restrooms were clean. We will stay here again when in the area. We camped at Squaw Creek Campground (Linn County Park) in a Fifth Wheel. 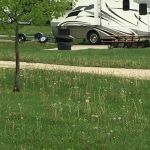 Full hook up, pull throughs with a cement pad for motorhome, are the pluses in this well maintained park. Sites are open and very close together are the minuses. Easy access in and convenient to Cedar Rapids. We camped at Squaw Creek Campground (Linn County Park) in a Motorhome. 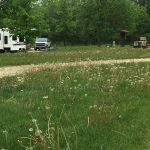 This is the most visually pretty campground we've seen in a long time, on a par with our other two favorites, River Park Campground in Menominee, Michigan or the Rockport State Park in Washington. No Wi-Fi, no laundry, no kid's playground, no store, no newspaper stand and no map on-site (which made it tough for us to find Loop A), but it is a delight. We wish we could have stayed two weeks and soaked up the serenity. Very spacious sites. We stayed in Loop A, with a full hookup site and enough room to set up a suburban home. Dirt road, paved site and paved patio. $25 if you arrive without reservations, $30 if you make reservations on-line. Loop B (no sewer) is $19/night. This county park is wonderful! We camped at Squaw Creek Campground (Linn County Park) in a Travel Trailer. This is an excellent park. Well taken care of with spacious sites. Do need to be careful on choice as not all are level but many work well. We camped on and off here all summer. If had FHU it would be a 10. They are in the process of adding 20 FHU sites to be open next summer. Can buy a coupon book that reduces the cost. It is a bargain. We will be back here when we return to the area. We camped at Squaw Creek Campground (Linn County Park) in a Fifth Wheel. Paved roads into park; gravel sites; on hills and hard to level. Very clean and quiet. Dump station was one of the best we have seen. Has trails, and long pull-through sites. Would stay here again. We camped at Squaw Creek Campground (Linn County Park) in a Motorhome. Are you affiliated with Squaw Creek Campground (Linn County Park) ?